A new season means a clean slate for skaters. All the obstacles and hardships endured during the past season are put in the past and all skaters get a chance to re-write their story as they begin the new season. Figure Skaters Online recently caught up with the international squad members of Team Cain. In the fifth and final part of our week-long series, we spoke with 2014 U.S. Junior Champion Amber Glenn, who is looking for a fresh start this season. The past two seasons haven’t gone as planned for Amber Glenn. After winning her junior title in 2014 and then making her senior debut the following season, she withdrew from the 2016 U.S. Championships due to some health issues and was off the ice for an extended period of time. She eventually resumed training, but at a new training location with Peter and Darlene Cain as her new coaches. The 2016-17 season started off on a high note for the 17-year-old from Plano, Texas. 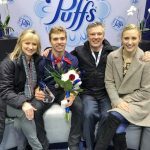 She placed fifth at Nebelhorn Trophy, 4th at Golden Spin and 8th at the U.S. Championships, which was her highest placement at Nationals on the senior level. She was selected to compete at the World Junior Championships, but withdrew in early March due to personal reasons. Looking back on the past two season, Glenn said she is proud of all the things she has to overcome, both in life and in skating. She says she is also most proud of her progress as a senior lady, noting that despite withdrawing from the 2016 U.S. Championships, she still received two ISU Challenger competitions (Nebelhorn and Golden Spin) this season. “It (Those competitions) really helped me mature as a skater,” she noted. Though having to withdraw from the World Junior Championships, Glenn says she is doing a lot better now and things are going really well. Putting the past behind her, Glenn is already hard at work on next season. She tells Figure Skaters Online she will be skating to the film soundtrack of The Red Violin by John Corigliano, choreographed by Scott Brown. Glenn with training mate Alex Krasnozhon and choreographer Scott Brown. After initially having a hard time choosing the music she wanted for her free skate, Glenn says it felt natural to her right away. “I was just skating around to it and I loved how I skated to (the music),” she enthused. Brown also choreographed Glenn’s short program, which is to the song, “Fever” (The Heat Version) by Beyoncé. Glenn said she was actually playing the song for others at the rink as a possible program for them, not for herself. “I was kind of playing it for the pairs, or for Brooklee (Han), to listen to, for maybe a program, I wasn’t really thinking of me, and then I really loved it, I loved skating around to it and I thought it was different and we decided it would be a good short,” she explained. Like most of her training mates, Glenn will debut her programs at the Philadelphia Summer Championships at the beginning of August. This summer, Glenn says she will focus on getting her triple-triple combinations more consistent. She says she has been practicing a lot of different combos, like loop combos or half loop-salchows. “I have been training new things, and just little things that could maybe help with GOEs or points. I have been really focusing on that aspect,” she stated. In looking to improve her program components, Glenn says she is trying a new tactic. Glenn says she has no plans this summer except for being prepared for her first competition. To read part one, which featured Ashley Cain and Timothy LeDuc, click here. To read part two, which featured Timothy Dolensky, click here. To read part three, which featured Brooklee Han and Aimee Buchanan, click here. To read part four, which featured Alex Krasnozhon, click here.